Gallic acid (3,4,5-trihydroxybenzoic acid) is found in a wide variety of plants; it is extensively used in tanning, ink dyes, as well as in the manufacturing of paper. The gallate moiety is a key component of many functional phytochemicals. In this work electron paramagnetic spectroscopy (EPR) was used to detect the free radicals generated by the air-oxidation of gallic acid. We found that gallic acid produces two different radicals as a function of pH. In the pH range between 7-10, the spectrum of the gallate free radical is a doublet of triplets (aH = 1.00 G, aH = 0.23 G, aH = 0.28 G). This is consistent with three hydrogens providing hyperfine splitting. However, in a more alkaline environment, pH >10, the hyperfine splitting pattern transforms into a 1:2:1 pattern (aH (2) = 1.07 G). Using D2O as a solvent, we demonstrate that the third hydrogen (i.e. aH = 0.28 G) at lower pH is a slowly exchanging hydron, participating in hydrogen bonding with two oxygens in ortho position on the gallate ring. The pKa of this proton has been determined to be 10. This simple and novel approach permitted the understanding of the prototropic equilibrium of the semiquinone radicals generated by gallic acid, a ubiquitous compound, allowing new insights into its oxidation and subsequent reactions. Gallic acid (3,4,5-trihydroxybenzoic acid), found in a variety of plants, is extensively used in tanning, ink dyes, as well as in the manufacturing of paper . In addition, the gallate moiety is a key component of many foods and drinks, e.g. there are two gallate moieties in the important polyphenol, (-)-epi-gallocatechin-3-gallate (EGCG); this and related polyphenols are responsible for the antioxidant, anticarcinogenic, and antiviral properties of some of the most widely consumed beverages in the world, such as green tea [2, 3]. The three aromatic phenoxyl groups of gallic acid are prone to oxidation with the formation of hydrogen peroxide, quinones, and semiquinones . We have observed the formation of two distinct semiquinones formed upon the oxidation of gallic acid. Here we have investigated the nature of these two different radicals. Gallic acid (3,4,5-trihydroxybenzoic acid, CAS No. : 149-91-7) was obtained from Sigma, USA; sodium hydroxide was from Fisher. All experiments were carried out in 100 mM potassium phosphate. The final concentration of gallic acid was 1 mM, unless noted otherwise. All solutions above neutral pH (alkaline solutions) were prepared by adjusting with 1 M sodium hydroxide solution. EPR spectroscopy was done using a Bruker EMX spectrometer equipped with a high-sensitivity cavity and an Aqua-X sample holder. Spectra were obtained at room temperature (24-27°C). Typical EPR parameters were as follows: 3510 G center field; 10 G sweep width; 9.852 GHz microwave frequency; 20 mW power; receiver gain varied as needed; modulation frequency of 100 kHz; modulation amplitude of 0.10 G; conversion time of 40.96 ms; and time constant of 20.48 ms with 20 X-scans for each 1024 point spectrum. Spectral simulations of EPR spectra were performed using the WinSim program developed at the NIEHS by Duling . In the experiments to determine the second pKa of the gallate free radical 5.0 mL of 10 mM gallic acid (final concentration) was spiked with various amounts of 1 M NaOH to obtain EPR spectra of the gallate free radical at different pH-values. For these experiments, EPR spectra were obtained at room temperature. Typical EPR parameters were as follows: 3510 G center field; 10 G sweep width; 9.852 GHz microwave frequency; 1.282 mW power; 1 × 104 receiver gain; modulation frequency of 100 kHz; modulation amplitude of 0.20 G; conversion time of 40.96 ms; time constant of 40.96 ms with 5 X-scans for each 1024 point spectrum. Quantitation was done using double integration of spectra. With spectra having poor S/N, line height was used to estimate relative concentrations of a species using the results of the double integration of a spectrum of that same species with good S/N as a benchmark. The air-oxidation of gallic acid at near-neutral pH produces a semiquinone free radical that is easily observed by electron paramagnetic spectroscopy (EPR), Figure 1. This spectrum appears as a doublet of triplets and consistent with hyperfine splittings by three protons having hyperfine splitting constants of 1.00 G, 0.23 G, and 0.28 G. However, when the pH is increased a classic 1:2:1 EPR spectrum is observed, which is consistent with hyperfine splitting from two identical protons, aH (2) = 1.07 G, Figure 1[6, 7]. The spectrum at high pH is easily explained by a radical that is totally deprotonated, thereby providing a symmetrical structure with two identical hydrogens. The larger hyperfine splittings also suggest a greater spin density in the aromatic ring upon loss of a second phenolic proton, as would be expected. However, the spectrum observed at lower pH having three different hyperfine splittings suggests an unsymmetrical structure with three protons; spectra with similar shapes from gallate-derivatives have been observed [7–9]. The pH-dependence of these spectral shapes suggests these spectra are due to species of different protonation. EPR spectra of the gallate free radical at pH 9 and 11. The solution contains 1 mM gallic acid in 100 mM potassium phosphate with the pH adjusted by addition of NaOH. Top: This spectrum is consistent with hyperfine splittings due to three protons. The apparent hyperfine splitting constants for these three protons were determined using WinSim program, aH = 1.00 G, aH = 0.23 G, and aH = 0.28 G. Under our experimental conditions this spectrum is observed from about pH 7 to approximately pH 10. Bottom: EPR spectrum of the gallate free radical at pH 11. This 1:2:1 spectrum is described by two identical hyperfine splitting constant aH = 1.07 G (2). Gallic acid has four potential acidic protons having pKa values of 4.0 (carboxylic acid), 8.7, 11.4, and >13 (phenolic OHs) [10, 11]. The known pKa values of the gallate radical are ≈4 for the carboxyl group and 5.0 for a phenolic hydrogen . Thus, under the two pH conditions (9 and 11) of Figure 1, the carboxylic acid as well as a phenolic-OH of the semiquinone will be ionized; the proposed structures of these radicals are as presented in Figure 1. The 1:2:1 splitting of the species observed at high pH is consistent with hyperfine splittings due to the two identical ring protons. However, we propose that the third hydrogen splitting in the spectrum observed at lower pH is due to a slowly exchanging proton; this proton is participating in hydrogen bonding with two oxygens in ortho position on the gallate ring. A rapidly exchanging proton would produce no hydrogen splittings. However, the third proton splitting could also arise as a result of oligimerization . 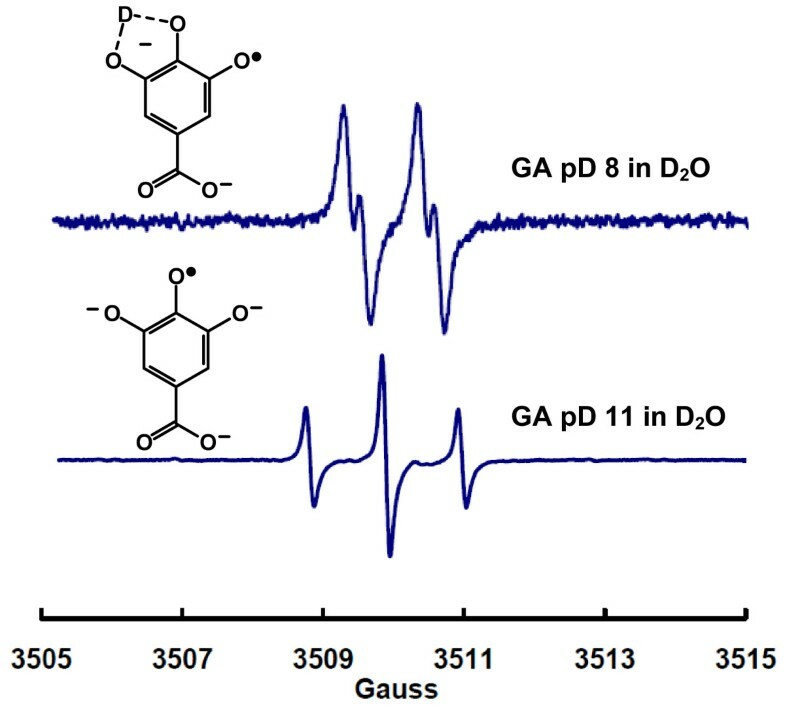 If the third splitting observed in our experiments between pH 7-10 is due to a slowly exchanging proton, then generating the gallate radical in D2O should produce an EPR spectrum showing only two proton splittings as the protons on carbons 2 and 6 of the gallic moiety are not exchangeable. Thus, in D2O the hyperfine splitting from these two ring-protons will remain. However, the exchangeable hydron (H+, dominant in H2O) will be replaced by a deuteron (D+, dominant in D2O) simply due to mass action. Indeed, in D2O at near-neutral pD the EPR spectrum of the free radical produced from the air-oxidation of gallic acid simplifies compared to aqueous solution; compare the top spectrum of Figure 2 with the top spectrum in Figure 1. The change is consistent with the loss of a splitting from a slowly exchanging proton that has been replaced by a deuteron; deuterons have a spin of 1, however the value of the nuclear magneton of a deuteron is only about 15% of that of a proton. The hyperfine splitting due to the deuterium is not seen under our experimental conditions, rather it manifests itself in the linewidth. 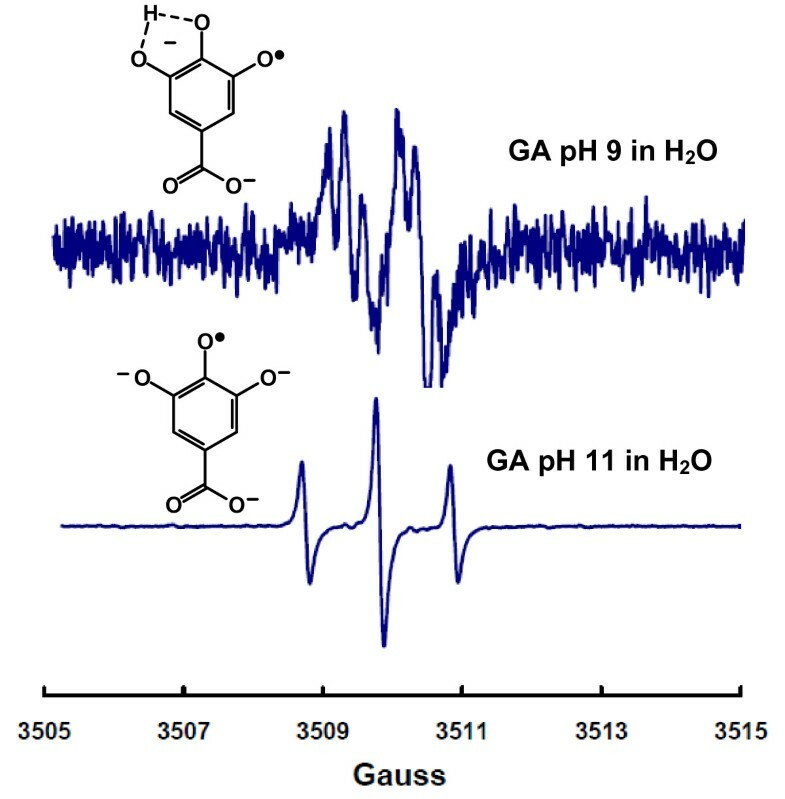 When the pD was increased to 11, the EPR spectrum of the gallate radical (Figure 2 lower spectrum) is identical to that observed in water at pH 11, as seen in Figure 1. This indicates that all phenolic hydroxyl groups are ionized. Thus, oligimerization does not occur under our conditions. The third hyperfine splitting observed in water, aH = 0.28 G, is due to a slowly exchanging proton. This proton is replaced by a deuteron when in D2O. The free radical derived from gallic acid at high pH (or pD) has symmetry such that the protons on carbons 2 and 6 are identical, producing the 1:2:1 spectra. However, at lower pH values, the slowly exchanging hydron imparts asymmetry to the gallate radical and adds a hyperfine splitting, resulting in an apparent doublet of 1:2:1 triplets. The apparent 1:2:1 triplet in the doublet of triplets comes from two similar splittings, 0.28 G for the slowly exchanging proton and 0.24 G for one of the ring protons, the other ring proton having a splitting of 1.00 G. The experimental assignment of this hyperfine splitting differs from that of Hagerman , but is supported by the density functional calculations of Severino et al. .
EPR spectrum of the gallate free radical in D 2 O. The solution contains 1 mM gallic acid in 100 mM potassium phosphate with the pD adjusted by addition of NaOH. Top: This spectrum is consistent with hyperfine splittings due to only two protons (aH = 1.04 G and aH = 0.21 G). (The apparent intensity of this spectrum should not be compared directly to the parallel spectrum in Figure 1 as the experiments were not designed for such comparisons to be made.) Bottom: EPR spectrum of the gallate free radical at pD 11. This 1:2:1 spectrum is described by two identical hyperfine splitting constants aH = 1.07 G (2), identical to the spectrum observed in H2O at pH 11. These data suggest that the second pKa of the gallate semiquinone radical (excluding the carboxyl moiety) is between approximately 9 and 11; the first pKa of the free radical derived from gallic acid has been determined to be 5.0 . To determine the second pKa of the gallate free radical, we gathered EPR spectra of the radical species generated by air-oxidation of a gallate solution over a wide range of pH values, Figure 3. At pH values lower than 10, a doublet of triplets was observed; this radical is below the limit of detection at all pH values >10. At pH values greater than 10 spectra with a 1:2:1 triplet splitting pattern were observed, consistent with all phenolic OH groups being ionized. These data clearly demonstrate the loss of the protonated radical species at pH 10, with concomitant formation of the fully ionized species. Relative intensities versus pH for the two different gallate free radical species generated in different pH environments. ▲ corresponds to the species as seen in Figure 1, top spectrum; ● corresponds to the species of Figure 1, bottom spectrum. The relative intensities were obtained by dividing all values by the maximum intensity observed for the respective species. The concentration ratios of the two forms of the gallate radical were very different. The concentration of fully ionized species present at the highest pH (≈13) examined was approximately 1000 times greater than the protonated radical seen at pH ≅ 9. 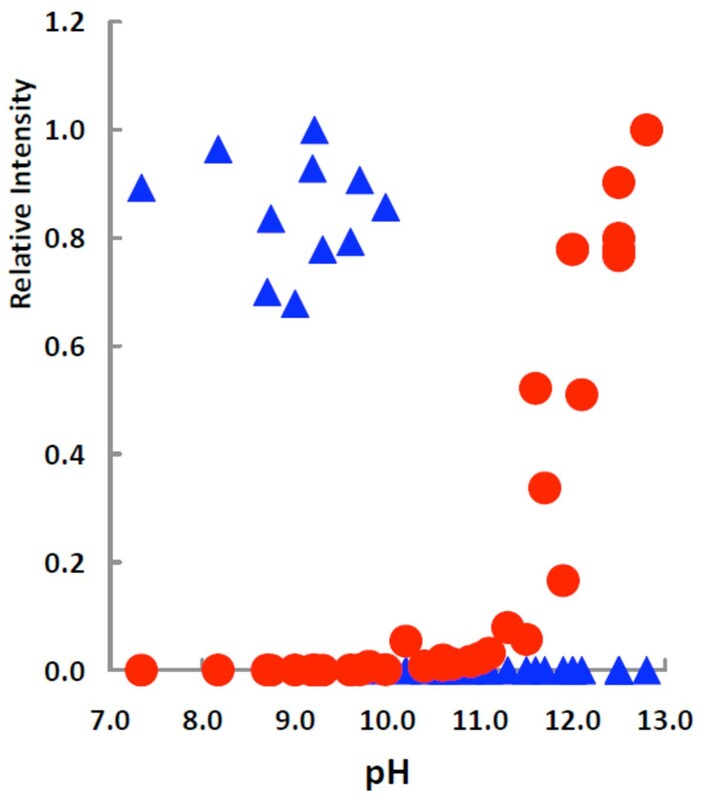 Typically one would expect an isosbestic point in such a plot as would be seen in a species distribution diagram of a simple titration of a weak mono-acid with a weak mono-base. However, there is not a one-to-one correspondence in species concentration at pH values <10 compared to pH values >10; the intensity of the EPR signal of the fully ionized species increases dramatically in the more alkaline environment. The highest concentration of the fully ionized radical species present at high pH (≈13) is about 1000 times greater than the singly ionized species seen at lower pH (≈9). This increased signal is due in part to the fact that at higher pH the rate of disproportionation of semiquinone radicals decreases [4, 14]. In addition, as the pH increases the rate of air-oxidation increases, thus the lack of a one-to-one correspondence for the concentrations of the two different gallate radicals. Thus, the second pKa of the gallate free radical is 10. In a study by Oniki and Takahoma of the oxidation of gallic acid, it was proposed that the EPR spectrum of the gallate radical observed at ≅ pH 10 was due to covalent bond formation in the gallate solution . Our observation of a slowly exchanging hydron may explain in part their observations. Previously, there were no experimental data available to determine the second pKa of the free radical derived from gallic acid. However, Jovanovic determined the two pKa values of free radical derived from methyl gallate to be 4.4 and 9.2 ; these pKa's for the free radical derived from gallic acid are 5.0 and 10. This is consistent with the lower pKa values of two acidic OH-groups on the ring of methyl gallate (8.0 and 11.6) compared to gallic acid (8.7 and 12.4) . That the differences in the pKa values of the reduced species and their radicals are each 0.6 and 0.8 is striking. This suggests a linear offset in the electron density on the phenoxyl oxygens will occur in a gallate moiety upon oxidation of the hydroquinone to a semiquinone radical, parallel to that seen upon the one-electron oxidation of para-hydrobenzoquinones . In conclusion, we have demonstrated that the third proton splitting of the gallate radical observed in the pH range of 7-10 is a slowly exchanging hydron; this proton is mostly likely participating in hydrogen-bonding with two oxygens in ortho position on the gallate ring thereby bringing asymmetry to the radical. We found the second pKa of the gallate free radical to be 10. This work was supported by NIH grants P42ES013661 and R01GM073929. ACE was supported in part by The University of Iowa Graduate College. ACE, WP and BAW ran the experiments and contributed to experimental design. GRB contributed to experimental design and wrote the paper with assistance from ACE.